How Does Cheesecake Factory Compare to Junior's Famous NYC Cheesecake? New York City has been blessed with yet another chain restaurant to turn our beloved metropolis into the suburban, mall-scaped wasteland we’ve always wanted it to be. 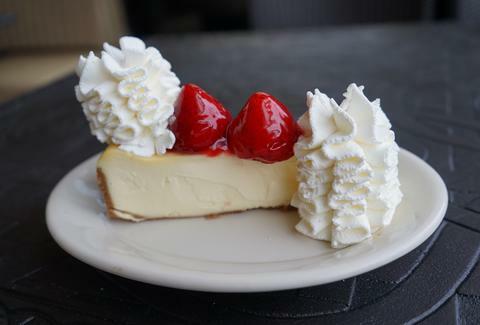 Today, Cheesecake Factory officially makes its high-calorie mark on Gotham, opening its first-ever location within city limits at the Queens Center mall in Elmhurst. The California-based chain is probably best known for its sprawling 250-item menu and notoriously enormous portions. But its signature foodstuff is, of course, cheesecake -- more than 30 kinds, in fact. When many New Yorkers hear “great food,” their first thought is probably not White Chocolate Caramel Macadamia Nut Cheesecake, much less other Cheesecake Factory staples, like Tex Mex Eggrolls or the infamous Louisiana Chicken Pasta -- a dish that has been ranked among the unhealthiest restaurant meals in the country. Topped with fresh whipped cream, this silky cheesecake was certainly light, like sticking your spoon into a blob of cheesecake-flavored yogurt -- the type that healthy-ish people in California probably love to eat after going to the gym (the same type of people who think In-N-Out is better than Shake Shack, but we can save that for another time). The light Factory cheesecake, which certainly didn't offer as much satisfaction as the more substantial yet still delightfully airy Junior's variety, comes on a cardboard-thin graham cracker crust, which was not at all crunchy or crumbly like a homemade cookie crust. That’s another major difference from the style at Junior’s, which uniquely features a thin layer of sponge cake on the bottom instead, giving legitimacy to the name "cake" being used to describe this dessert. Without that cake crust, you might as well call it a Wedge of Sweetened Cream Cheese. That said, I slowly ate the entire slice. All things considered, the Cheesecake Factory version didn’t leave much to complain about -- except that it wasn’t Junior’s and never will be. NYC is certainly big enough for both styles, but it’s safe to say that the California transplant won’t be overthrowing Junior’s for the local cheesecake crown anytime soon. Melissa Kravitz is a writer based in NYC. She would choose a slice of actual cake over cheesecake any day.